I hate the early nights we have at this time of year, when sunset comes to London at around 15.52 and so many things, including most protests take place in twilight or darkness. So I look back with some warmth at my diary for May 25th, when the sun only set at 9pm, giving me some colourful sunset skies to watch from the train window on my way home. Photographers notice the light more than others, or at least we should, though on some winter days I’ve been caught out by the falling light and only realised too late that my shutter speed in some auto mode has dropped far too low giving an unwanted motion blur to my subjects, often only noticeable when I zoom into the image. Viewing the whole image on the camera back can seem sharp even when images are unusable. The answer I’ve now adopted on the Nikons is auto ISO. Working in Program mode and setting the minimum shutter speed to perhaps 1/100th and the maximum ISO to 6400 or even 12,800 more or less guarantees usable results except at more extreme focal lengths. Once I realise its getting dark, or have a need for flash or greater depth of field or stopping faster movements I’ll change the settings, but until then I find this works. The Nikons have an Auto setting for the minimum shutter speed, which takes into account the focal length of the lens, and does allow you to choose different settings, faster or slower, based on this, which sounds useful, but I think fails with moving subjects, where the fixed speed seems to work better. But back in those longer days, I had no such problems. 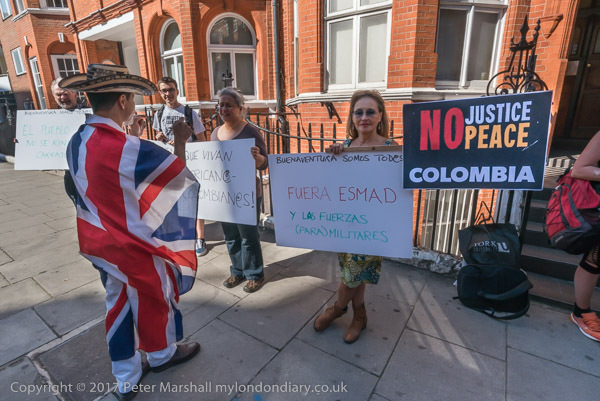 I started work at 4pm – which at this time of year is just after sunset, but towards the end of May was bright sunlight outside the building behind Harrods which houses both the Ecuadorian and Colombian embassies. 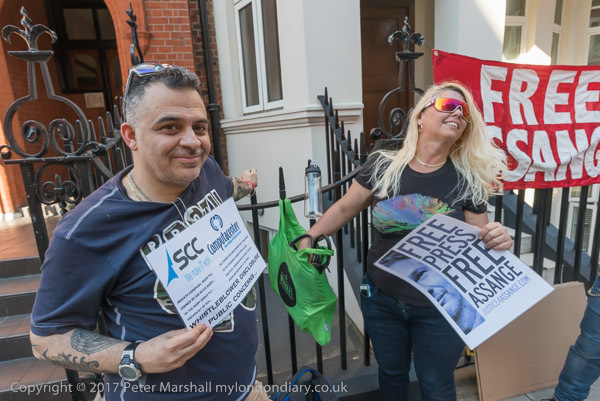 A small die-hard group of supporters of Julian Assange was outside as they had been on so many occasions over the almost five years he had been holed up in there. 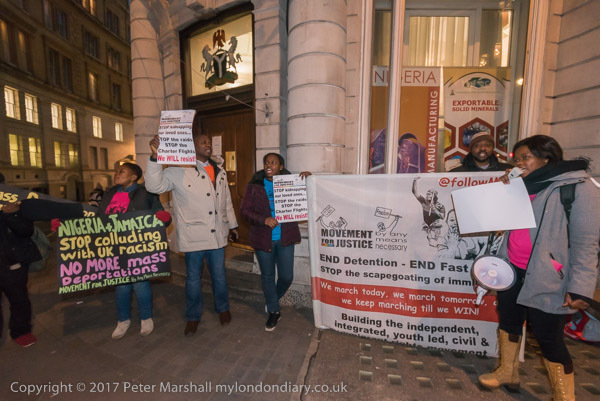 His continuing detention is a monument to the stubbornness of Theresa May, but it is a pointless act which has cost us millions and harms us diplomatically. He should have been allowed to leave for Ecuador when granted immunity there. Protesting on the same pavement – and with some overlap both physically and in terms of people – were the Colombian Solidarity Campaign, demanding that the Columbian government end the use of force against the people of Buenaventura and instead tackle the social, economic and ecological problems that have led to the civic unrest there. Photographically my problems were mainly that half of the protest was in bright sun and half in shade, giving a huge dynamic range. Even with careful exposure this still requires considerable post-processing to reveal shadow details and tone down the brightly lit areas. 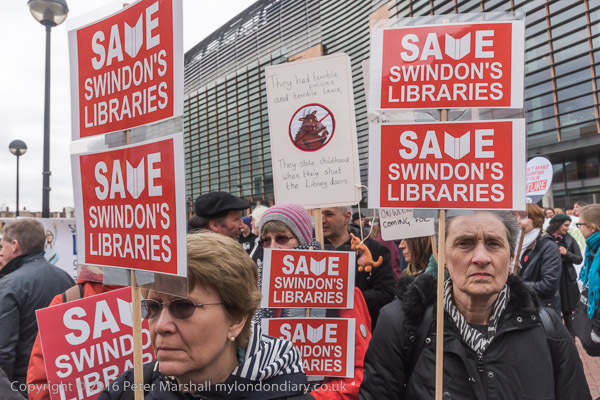 Timing was also a problem, and although the protest was due to begin at 4 pm, people only began to drip in slowly some time after that – and I had to leave before the event had really got going. South American time, as I learnt when I visited Brazil some years ago – is a rather different concept to English time. Axe the Housing Act were rather more punctual for their protest intending to make housing an issue in the snap general election which was taking place, thanks to a moment of madness on the Prime Ministers walking holiday. Labour were still in disarray, with its centre and right MPs refusing to accept the zeitgeist that had moved the party membership to elect Jeremy Corbyn and were still acting like spoilt children who had lost their toys and encouraged and supported by a Tory-dominated media were determined to undermine him in any way possible with a series of smears, lies, coup attempts and party machinations. Had they accepted defeat with any grace and got down to work for the party rather than for their own interests the election would never have been called, as Labour would have had a massive lead in the opinion polls. But we had an election, and housing despite the effects of protesters which have put it on the political agenda, never became a major issue. It’s an area where Labour still has a great deal of work to do, with many Labour councils still busy demolishing council estates and cosying up with private developers despite a new direction from the leadership which at the party conference a few months later called for policies based on housing people rather than realising asset values. Its a battle still to be fought, let alone won. Although the protest was called a vote for decent, secure homes this wasn’t generally a choice on our ballot papers. 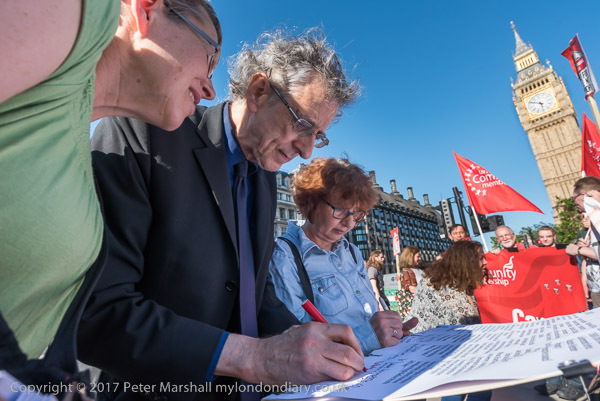 The picture above shows Piers Corbyn (Jeremy’s elder brother) signing the poster-sized letter which the protesters were to deliver to Downing St, and the sun is still bright at ten to six, a time when now we would have passed through civil twilight and nautical twilight and be about to move from astronomical twilight into full blown night time. I left the housing protesters as they left for Downing St and walked down to Tate Britain, where the PCS Culture Group were to picket the leaving party for retiring director Nicolas Serota. Staff there, many of whom are on zero hours contracts with lousy conditions from Securitas and are paid on or close to minimum wage – much less than the London Living Wage and something the Tate could not dare to justify for anyone it directly employed were asked to contribute to a leaving present for him of a sailing boat – and of course were not invited to his leaving party. 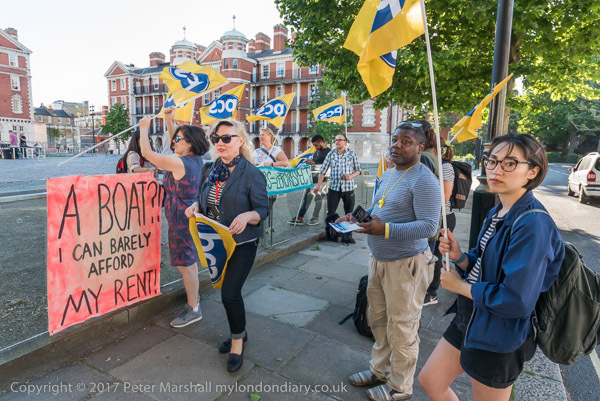 Instead they launched their annual Golden Boat Awards, naming Serota as the first recipient for his services to the cause of privatisation, casualisation and low pay at the Tate. 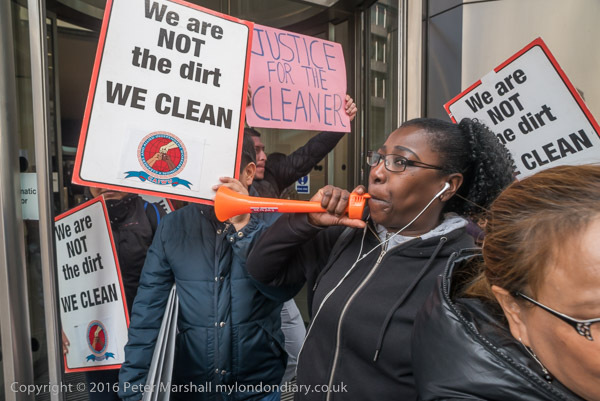 They demand an end to this cheapskate use of facilites companies to provide staff who should be employed directly with acceptable conditions and pay. It was around 7pm when I left the Tate, still two hours before sunset. One of the reasons I post here about my work on My London Diary earlier in the year is to check up on that web site. In some ways its a rather primitive site, a throw-back to the early days of the web, entirely hand-coded, though usually with the aid of an ancient version of the best WYSIWYG software, though now that outdated description ‘What You See Is What You Get’ no longer really applies, and what I see when I’m writing the pages is very different to the web view. I first designed the site back in 2001, and even then it was somewhat archaic, reflecting my views on simple web design at at time when flash bang and wallop was infecting the web, largely running on our relatively slow connections that weren’t ready for it. Designing image-loaded sites like this that were reasonably responsive was something of a challenge, and needed relatively small images carefully optimised for size, with just a small number on each page. Although the site still has the same basic logical structure, times and the site have changed a little to reflect the much higher bandwidth most of us now enjoy, with several re-designs and many more images per page, as well as slightly larger and less compressed images. Size is now more a problem of controlling use (or abuse) of images than download time, and new images are now always watermarked, if fairly discretely. The latest small changes in design have been to make the pages ‘mobile friendly’ without essentially changing their look. I suspect that My London Diary is one of the largest hand-coded sites on the web – with over 150,000 images on over 10,000 web pages. But the simple site design means the great majority of the time involved in putting new work online isn’t actually the web stuff, but editing the images and writing the text and captions, so there is little incentive for me to move away from hand-coding. 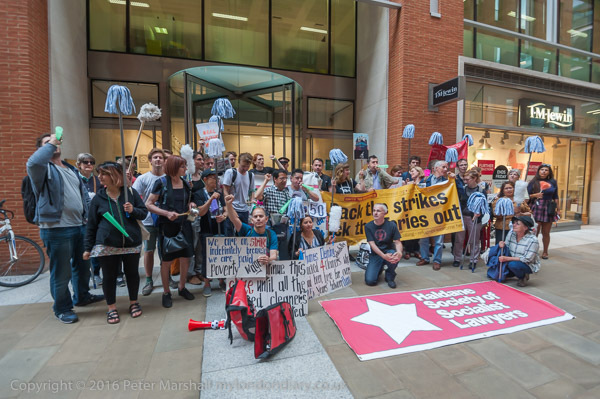 This morning I opened the pages on End homophobic bullying at LSE , the first protest I covered after returning from Hull, only to find I’d not put any captions on them, not even adding the spaces between pictures for them to go in. So before I started to write about them I had work to do. Otherwise I might have had more to say about the pictures. Yet again how useful the fisheye can sometimes be, or about reflections in pictures or to fulminate against homophobia, the failure of LSE management to live up to the pricinciples the instituion espouses, the inherently evil nature of out-sourcing and the need to treat everyone with dignity and respect and to pay a proper living wage. But today you can relax and take that as read. The pictures are workmanlike, they serve a purpose, do the job, but it wasn’t one of my better days. Dull weather perhaps didn’t help, but sometimes the magic just doesn’t happen. The following day was perhaps a little better (I’ll let you decide) and certainly much busier, with pictures from five events. 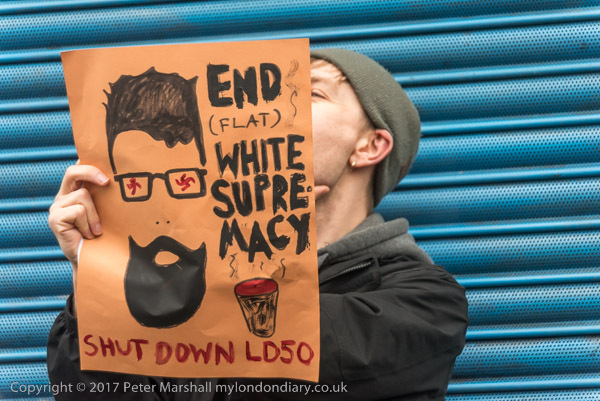 I started with Shut race-hate LD50 gallery, a crowd outside the place which they say “has been responsible for one of the most extensive neo-Nazi cultural programmes to appear in London in the last decade” , but didn’t really offer a great deal to photograph. The gallery itself was on the first floor above a shuttered shopfront, and had clearly had a brick through a window, and there were a couple of arguments outside, but mainly it was scattered people standing in small groups on the street. 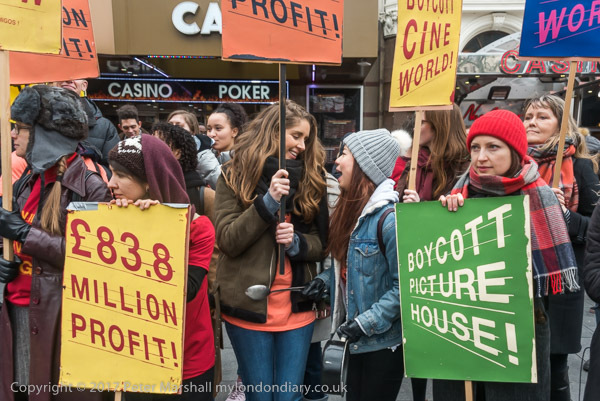 Trying to do too much, I arrived late and left early for the Picturehouse recognition & living wage protest in front of the Leicester Square Empire. There’s a pleasant symmetry in the picture above, but I missed the scrum later when Jeremy Corbyn arrived to give his support. It’s always difficult to know when to leave (or arrive) at events, and photographers spend many hours standing around waiting. But I’m impatient by nature and sometimes miss things. Other times I find a place to sit and read a book, and if its a decent book have been known to miss the action. But I was in Brixton, meeting Beti, a victim of gentrification and social cleansing, not in her case by one of the mainly Labour London councils but the Guiness Trust, formed by a great-grandson of the brewery founder in 1890 to provide affordable housing and care for the homeless of London and Dublin and now as The Guinness Partnership owning 65,000 homes in England. Betiel Mahari lived in one of these with her family on the Loughborough Park Estate in Brixton for ten years, paying a ‘social ‘ rent but was never given a secure tenancy. 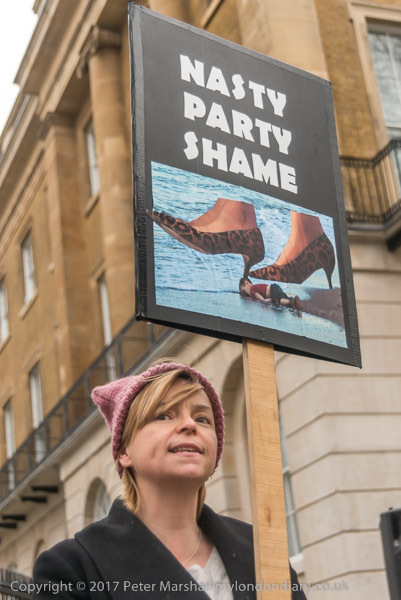 Guiness demolished her flat in 2015, giving her a new flat a few miles away in Kennington – but at a hugely increased ‘affordable’ rent, going up from £109 per week to £265. The move meant too she was unable to keep her full-time job as a restaurant manager, and is now on a zero-hours contract as a waitress and facing eviction as she cannot pay the increased rent. DWP incompetence meant that her benefits were suspended completely for three months (and on zero hours contracts the benefits have to be re-assessed every three months in any case) and Guiness were taking her to court over rent arrears. The case was heard around 10 days later and as thrown out by the judge who ordered the Guiness Partnership to pay Beti’s court costs, but the struggle to get this rapacious ‘social’ Landlord to treat her and others in similar straits continues. 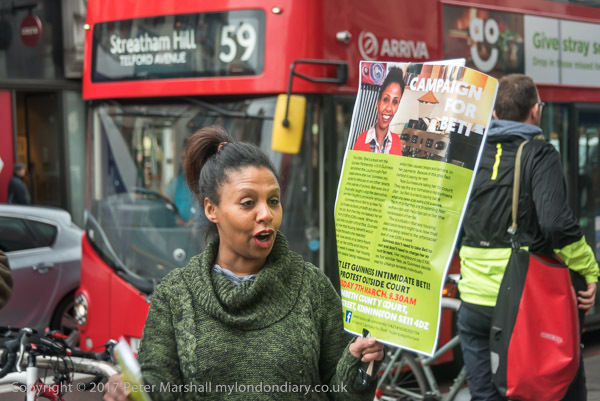 I was pleased to be able to support her, though not entirely happy with the pictures at Stop Unfair Eviction by Guinness, which also include some of Brixton Arches. 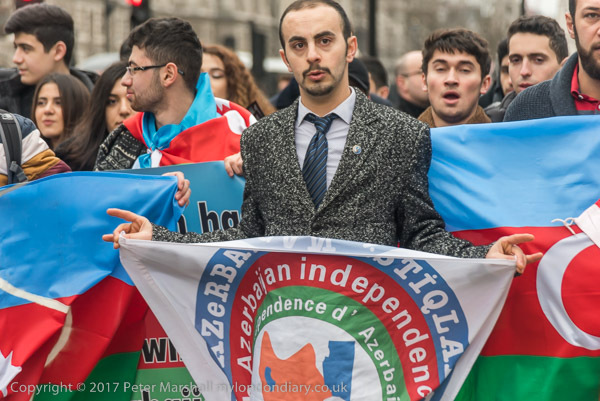 I arrived back in Westminster just in time to meet the Khojaly marchers coming down Whitehall to end their protest in front of Parliament. Few of us will remember the massacre on the night of 25-26 February 1992 when Armenian forces brutally killed 613 civilians in the town of Khojaly, including 106 women and 83 children, but the name Nagorno-Karabakh may prompt some memories. In 25th anniversary of Khojaly Massacre I try to give a little background to the still unresolved situation. 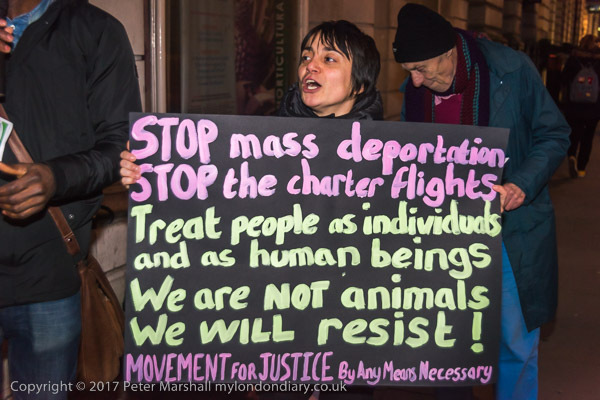 But I was on my way to an event marking the shameful failure of Theresa May and her government to take the action demanded by Parliament to bring the great majority of the refugee children stranded at Calais and similar camps into this country. By passing the Dubs Amendment, Parliament made its view clear and it reflects a failure of our constitution that there seems to be no legal mechanism to force the Tory government to carry this out. This is truly a stain on our country’s history and May and her cabinet deserve to be behind bars for this crime against humanity. Most nights Hull goes home early, and much of the centre seems deserted. Presumably at closing time people stagger out of the pubs, but until then the streets are eerily empty. Certainly on a Thursday evening when I was taking these pictures, though things liven up a little at the weekend. There is one car in my picture of North Bridge, though I think about the only one we saw as we crossed it, and that solitary figure appears in several of my pictures as she was walking around with me. You can see her again in Humber St, the centre of Hull’s ‘Fruitmarket’ area, which no longer sells fruit but is touted as “Hull’s modern, vibrant & unique cultural quarter, open all day every day“. It may be open all day, but it was pretty deserted at night in February. You can see her too reading the plaque under King Billy. And in the background there is a single cyclist and just a few distant cars. 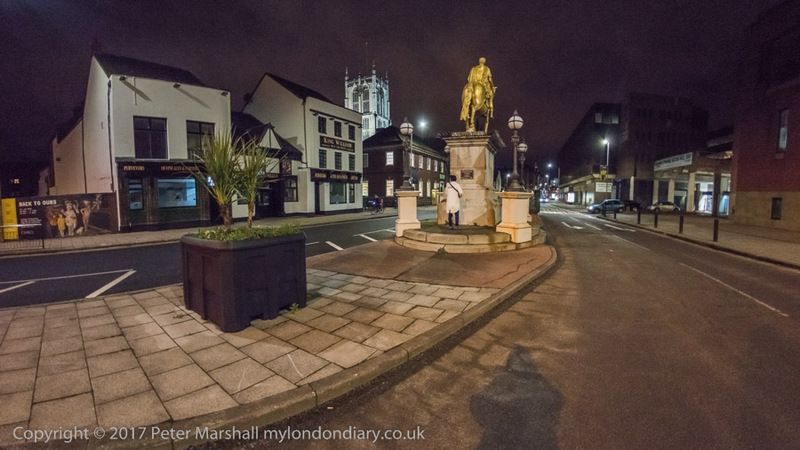 The square in front of Holy Trinity was deserted (though there was a regiment of orange barriers) as was Prince St and Posterngate, and it was only as we came to Trinity House Lane that we saw the first pedestrian, scurrying quickly away. Whitefriargate was empty too, with just one or two people around Monument Bridge, and I didn’t have to wait to get pictures of Queen Victoria Square without people – I didn’t particularly want to have the square empty, but it was, apart from some large object that had been left across it. This wasn’t taken in the early hours of the morning – when I was fast asleep in bed. This was early evening, around 7pm. Where was everybody? You can see a few more pictures from this walk, and see these larger – at Night in the Old Town, though you won’t find many more people. Obviously, these are panoramic images, though the format isn’t extreme, quite a good fit to my wide-screen monitor with just a small empty strip at top and bottom. I don’t much like extreme panoramic formats, though I do like panoramic images. These use the same cylindrical perspective that I’ve used since I bought my first swing-lens camera in 1990 – an expensive Japanese model. And although I’ve admired some of the more extreme angles of view used in some images, I’ve seldom wanted to use them myself. These pictures have a horizontal angle of view of around 145 degrees, a little greater than my old Widelux. Despite being taken at night, I didn’t use a tripod – all are handheld. 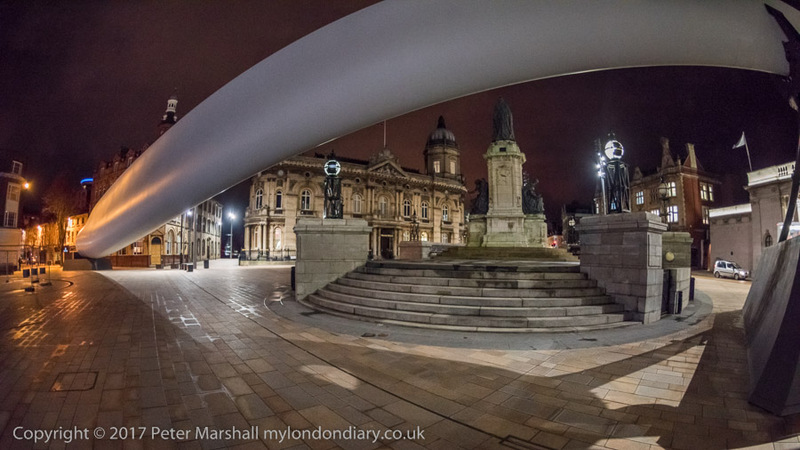 Tripods are quite useful with panoramas; you need them not to hold the camera steady, but to hold it absolutely level. Even small deviations can make some images unusable. But I’m an impatient man and like to keep things as simple as possible, concentrating on the image rather than technicalities. So though I own several tripods of widely varying size and utility I seldom disturb the dust on them; worthwhile tripods are always too heavy to carry. A tripod would have enabled me to use a lower ISO and reduce the noise in the images, but I quite like a bit of noise in night pictures, it adds to the mood. 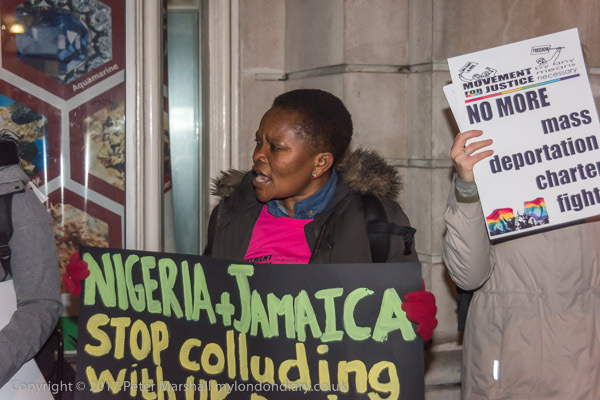 On Wednesday Jan 11th I joined Movement for Justice at their protest outside the Nigerian High Commisison in Shaftesbury Avenue, always one of London’s gloomiest streets, lined with tall buildings and large trees. Darkness was falling anyway as the protest began in late afternoon, and I set the D810 on Auto ISO with a minimum speed of 1/100th to take some pictures without flash. Working with the 28.0-200.0 mm f/3.5-5.6 lens the pictures were taken with the lens wide open and then the ISO went up to 4500 and then my maximum setting of 6400 and then the shutter speed began to drop. When it arrived at 1/40th I decided I had to use flash as these protests are fairly lively events. I kept the ISO fairly high, generally around ISO2500 to keep a decent amount of exposure in the background and avoid a typical bad flash look, and changed to shutter priority (Nikon’s flash gets some crazy ideas in P mode, using the ISO setting to stop down the lens, which to me makes absolutely no sense.) I began with a shutter speed of 1/160, but as usually happens that slowly crept up as handling the camera jogged the main control dial. 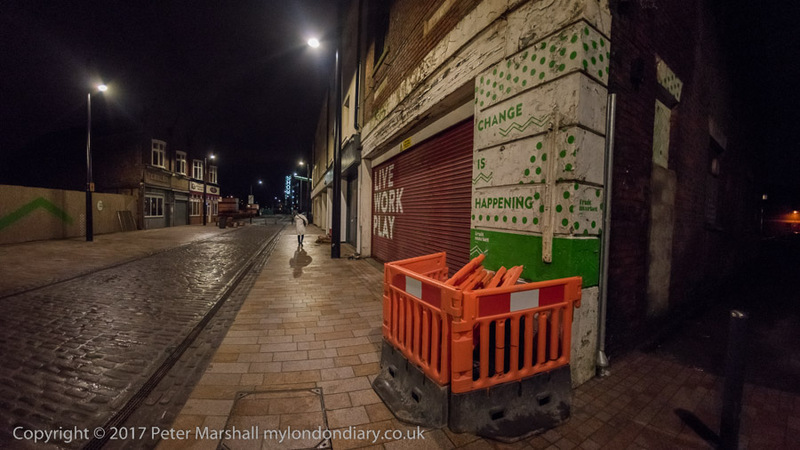 On the wideangle images taken with the D750 and the 16.0-35.0 mm f/4.0 I’d forgotten to move the dial from ‘P’ to ‘S’ with the result that the first few images I took were at f11 (see above) and gave a typical background gloom with closer figures far too light. I could compensate partly by some burning in with the RAW files in Ligthroom, but it wasn’t ideal. Fortunately I soon noticed the error and switched to working in A, aperture priority, mode. With the wide angle I’m less worried about shutter speed and decided I would get sufficient depth of field working more or less wide open, occasionally taking it down a half a stop or so. The 16-35 is a good performer wide open, but improved by just that little stopping down. 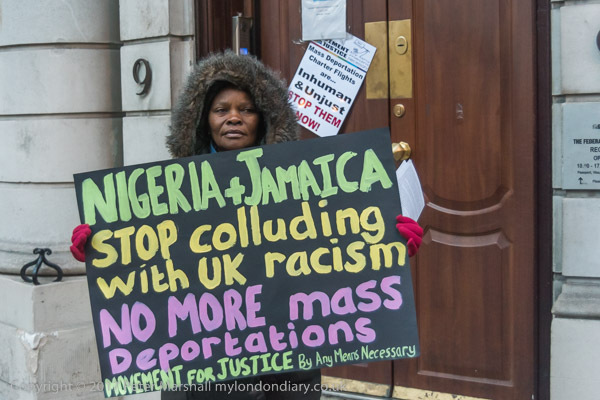 The Home Office arranges charter flights to Nigeria every couple of months, and to help with its figures isn’t fussy about who it decides to forcibly deport. Many are people who have been in the UK for most of their lives, with parents, partners and children here, as well as students who have not yet finished their courses, some are still in the course of making their claim for asylum, others people with serious health problems and carers for elderly and disabled relatives and some those who will face violence on their return, particularly if gay. 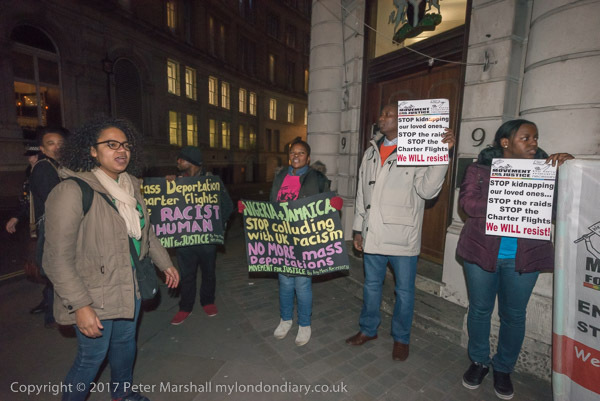 It was getting close to Christmas and I’d been expecting people to be too busy getting ready for the festival to be out protesting, but there were still protests happening in London. 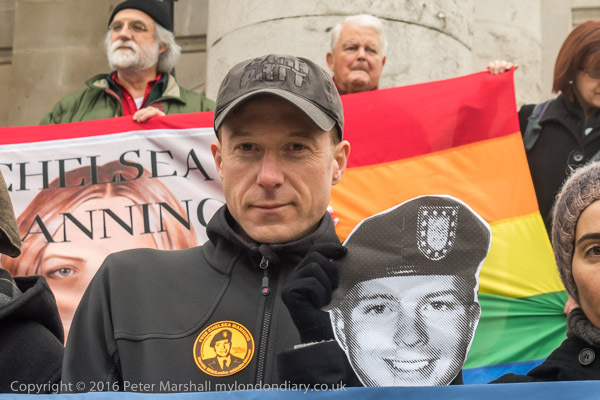 It was apparently Chelsea Manning’s 29th birthday and she was still in jail serving a 35 year sentence for espionage, theft and other offences. She had twice attempted suicide in the previous six months, the second time in November while in solitary confinement as a sentence for the first attempt. Both a formal petition and one with over 100,000 signatures had been made earlier in the month to President Obama for clemency, asking him to reduce her sentence to time already served. 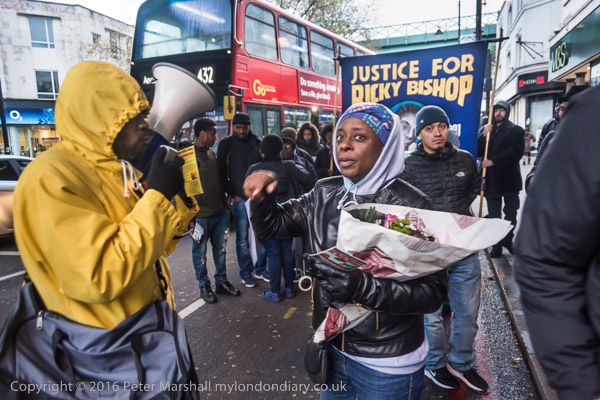 Most commentators thought it unlikely to happen, although the protesters were hopeful – and a month later Obama did commute all but 4 months of her remaining sentence, saying it had been ‘very disproportionate’. President Trump said that she was an ungrateful traitor and should never have been released, but despite this, she was set free in May 2017. 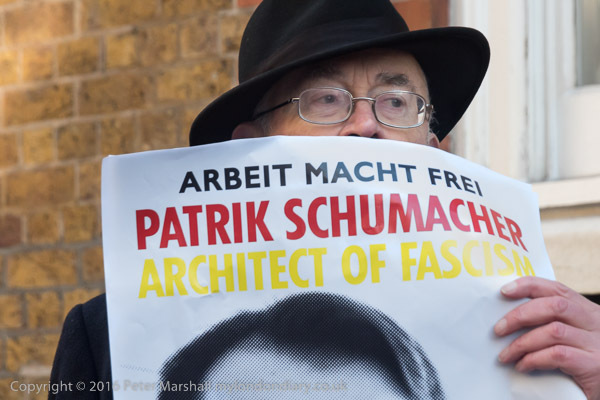 This was a static and more or less silent protest on the steps of St Martin-in-the-Fields – all that is allowed there – and I was pleased to be able to produce quite a variety of images – and of course to have another opportunity to photograph Bruce Kent. Kurds can always be relied on to be colorful, and I have a great deal of sympathy for them, particularly in Turkey where they have long been oppressed by the Turkish government. But this was a protest by Iraqi Kurds who have enjoyed some autonomy in Iraq since 1970 and more so in recent years, in support of the Peshmerga (or Peshmarga), the military force of the Kurdistan Regional Government (KRG) of Iraqi Kurdistan, established in 1992 with the protection of a US no-fly zone after the first Gulf War. The Peshmerga stood their ground when ISIS invaded Iraq, while the Iraqi army fled and were the most effective fighting force in the area. But ISIS captured a great deal of up to date US equipment left behind by the Iraqis and are better equipped than the Pershmerga, who need more support – and this protest was calling on the UK government for help. 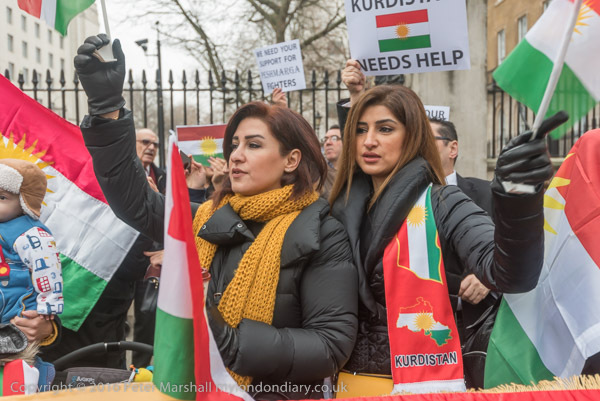 The UK and other western nations have been reluctant to give much help to the Peshmerga, and the scarf worn by the woman on the right , with its map of Kurdistan explains why, including as it does a healthy chunk of the territory of one of our allies, Turkey, as well as parts of Iraq, Iran and Syria (and I think some of Armenia), all of the territory where Kurds are in a majority. 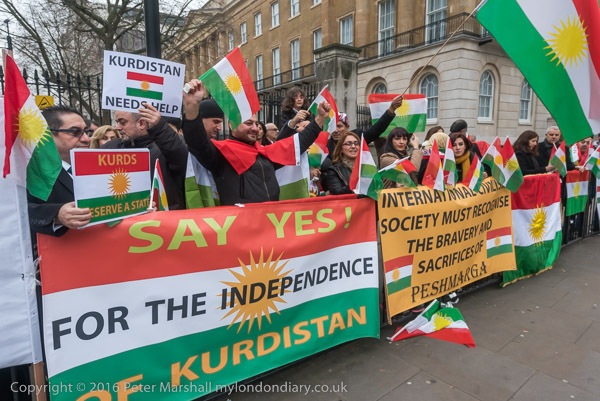 Having the Kurds fight and help defeat Da’esh is a good thing, but Kurdish nationalism and the establishment of a Kurdish state, which the protest was also for, would not suit the UK or USA, or for that matter, Russia. It might not even suit the Kurds, as the constitution of Kurdish Syria (Rojava) currently a de-facto autonomous region thanks to the civil war, while inspired by the Turkish Kurd leader ‘Apo’ (Abdullah Öcalan) from his Turkish jail is a rather different politics to that of the Iraqi Kurds. 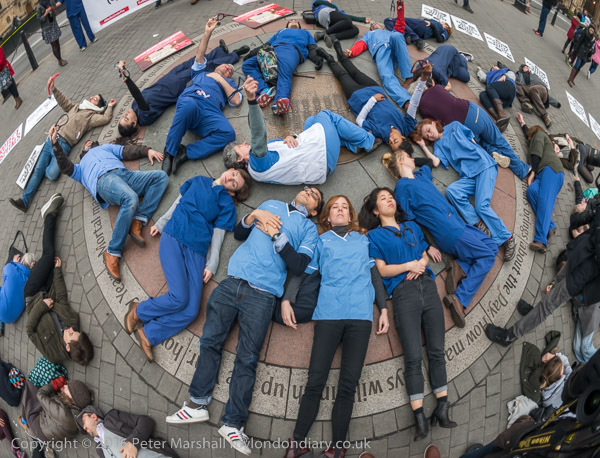 Syria was the subject of a very different protest a few hundred yards away in Old Palace Yard, where healthcare workers, including some who had volunteered in Syria, held a die-in at Parliament in solidarity with the Syrian people, calling for an end to the bombing by Russia and Assad of hospitals and for the UK government to pressure the Assad regime to allow the delivery of medicines and other aid. Since the protesters were on the circle in the pavement I thought it would be good to photograph them from directly above. Unfortunately I hadn’t brought my helicopter with me, not even a drone or a monopod, and the best I could do was to stand on the edge of the circle and stretch up my right arm forward and up as high as possible, holding the camera with the 10.5mm fisheye on it. I couldn’t see the viewfinder or the screen on the back of the camera, so had to do my best and then bring the camera down and look to see how I’d done. It took only one frame to decide it looked better without the camera strap in it, but quite a few to get the framing right. There was still one problem. Because I hadn’t had the camera above the centre of the circle it was definitely not a circle in the image. So I’m afraid I cheated, turning what had been a 1.5:1 image into the 1.31:1 image you see here and making that circle look much rounder. Cable St 80 years on. 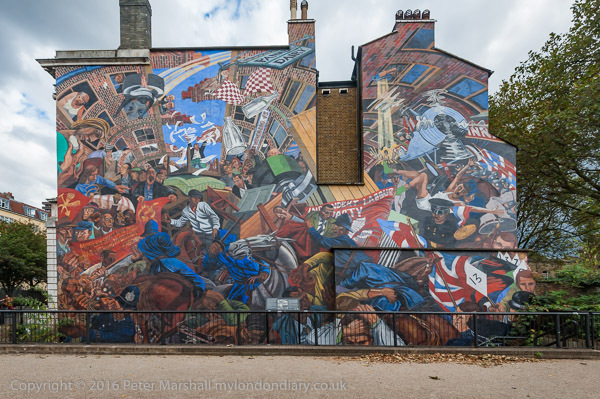 I wasn’t of course at the ‘Battle of Cable St’, commemorated in a fine mural, as it took place nine years before I was born, but there are still a few who were there around, notably Max Levitas, who not only came to the rally, but spoke at it. There was such a crush in front of the stage that I couldn’t get close enough to really see him, and was photographing over people’s shoulders and between heads, straining on tip-toe, and even taking some with camera held in the air, though on the D810 where the screen doesn’t tilt the Live View image is hardly visible in bright conditions. 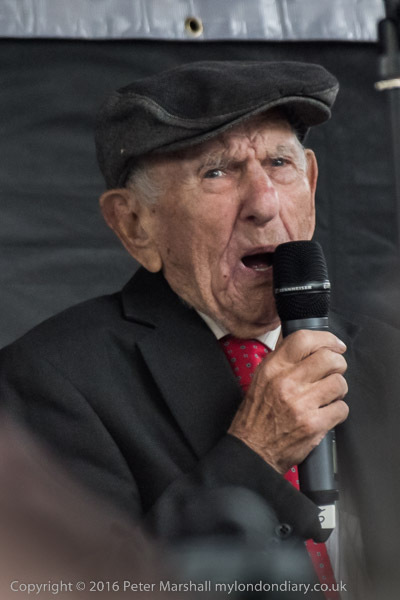 It was bright where I was standing, but not particularly on the stage where Max, who I’ve met number of times before, most recently just after his 100th birthday in June 2015, was sitting to speak. If his legs were a little weak at 101, his mind and voice were still strong. I needed ISO 3200 to combat camera shake, working with the lens wide open at 200mm (300 equiv) 1/320 f5.6 – though I found I needed to overexpose a little (+0.7) to get a decent histogram. This is a fairly extreme crop, even from that 300mm view, taken with the camera in landscape orientation and cropped to portrait and then some. 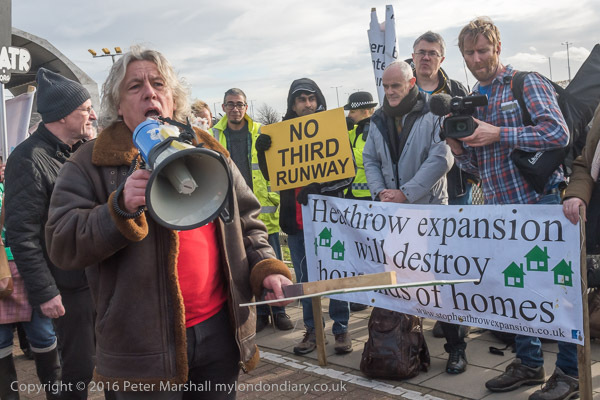 I only went into that rally when Max was speaking and left as he finished, though I had photographed other speakers elsewhere on the day. There were plenty of other speakers, but more interesting things were happening outside. I’d started the day in ‘Itchy Park’, now Altab Ali Park, where some of those attending did looks rather more like the 1936 originals, and although I photographed as always now in colour, I was pleased to be able to give the image just a little of a hand-coloured look. 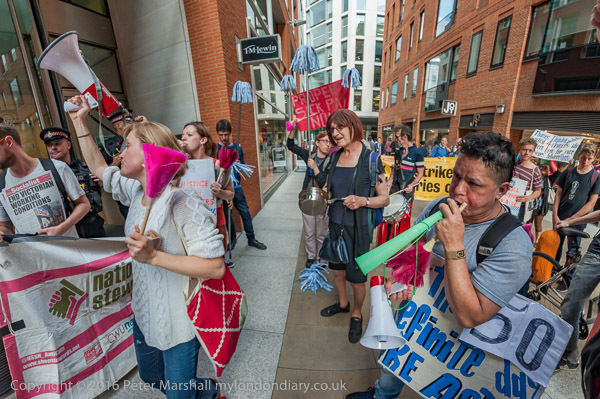 There were plenty of speeches before the march, including by East End historian David Rosenberg, who I’ve listened to talking about Cable St on various occasions, and TUC General Secretary Frances O’Grady who is someone I always enjoy photographing. The march itself was something of an anti-climax, and disappointing in that for much of its route the march, celebrating an event when people really did show that the streets were ‘Our Streets’ marched along the pavements or cycle path instead. 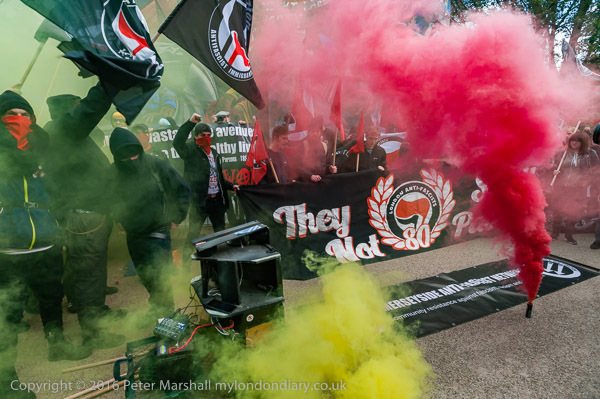 I’d gone on ahead on Cable St and so missed the only real battle of the day, when anarchist groups defied the stewards and police and insisted on marching on the road. I’d gone ahead of the march to meet up with Class War who I had been told would be at the Cable St mural, setting up there for a rally outside the main rally in the park beyond, where they were joined by other autonomous groups including London and Merseyside Anti-Fascists, 161 On Tour, Hunt Sabs and the Italian Communists for a celebration with rather more panache and colour and better music. 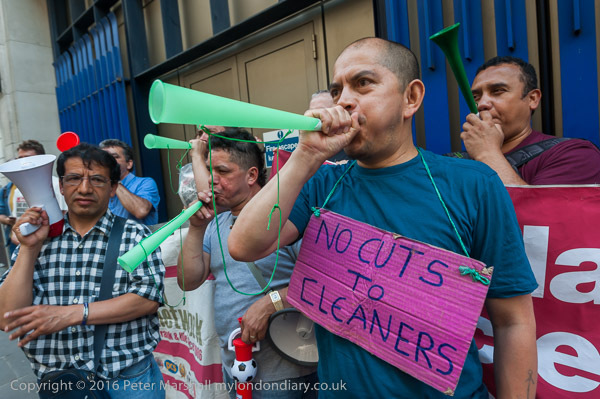 Cable St has become a legend of the Labour movement. 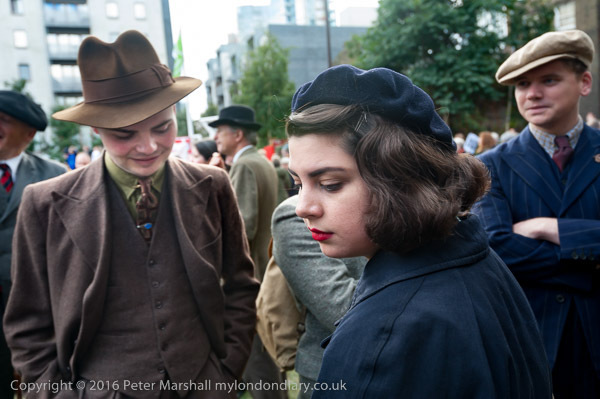 It’s perhaps worth pointing out that it wasn’t a fight with the fascists but with the police, that the Labour Party told people not to go, and the fighters were mainly the Jewish population of Whitechapel, Irish dockers and the Communist Party. And that the East End itself was full of fascists, with Bethnal Green just up the road a particular stronghold. 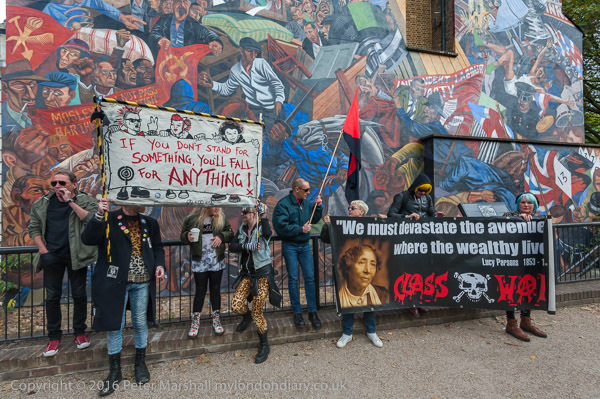 So that party outside in front of the mural really had more right to celebrate than Jeremy Corbyn and the other Labour Party members crowding on to the stage and into the park next door. And although one march was stopped, Mosley’s real defeat was not here but south of the river a year later, the Battle of Bermondsey on 3rd October 1937. 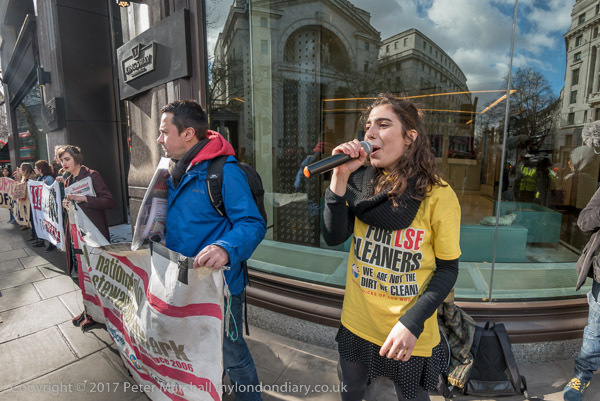 We didn’t know it on the day, but this was to be the final protest in aid of the Wood St cleaners, on the 50th day of their strike. Eight days later, shortly before the next protest it was called off as the UVW had arrived at a satisfactory settlement. The strikers had been there on the picket line for 58 days which says a great deal for the determination of the workers – and for the obduracy of the employers. 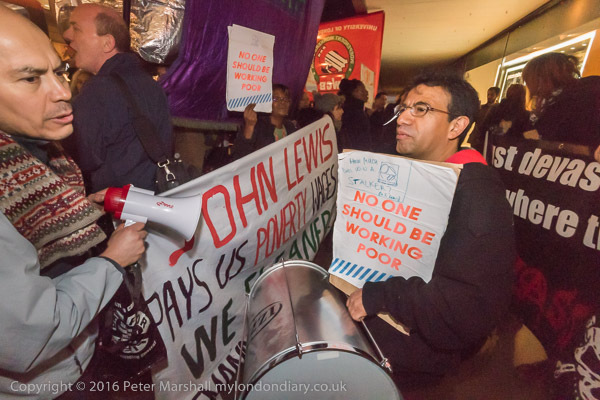 Strikes are costly for those taking part, who lose their wages, though it helps that there was a great deal of support and contributions from other trade unionists to the strike fund. This strike was particularly expensive for the UVW union, which was almost bankrupted by being saddled with over £10,000 in legal costs after being taken to court by the employers. Fortunately people came to their aid. Financially strikes don’t always make sense, but generally they are more about issues such as fairness and being treated with respect by management. Often, as in this case it is unfair sackings which precipitate strikes, which are a demonstration of solidarity with fellow workers. But the costs were surely higher for the employers, starting with their own legal bill, but more importantly in terms of their reputation and the likely loss of future contracts. Who would want to be associated with a company that led to people protesting outside your offices for 58 days – and during that time delivered an obviously inferior level of service? Rational and well-managed companies seldom suffer from strikes as they realise that their best interests are served by a motivated workforce that is well-managed and given reasonable pay and conditions. But outsourcing, with contracts being awarded for the short term to the lowest bidder encourage cowboy companies who try to cut costs by overloading the workers, and pay them and the lower levels of management as little as possible. Often when they take over the workforce from a previous contractor they renege on agreements made previously. It’s a recipe for strife and for poor quality performance which I’ve personally seen proved in schools and hospitals. 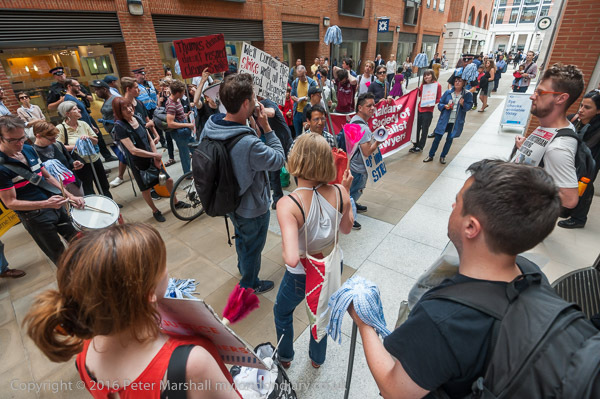 I don’t know how many pictures I took in all of the protests at Wood St, but it must be several thousand, and the 50 or so I posted on My London Diary for this evening’s protest were probably less than a tenth of those I took on this occasion. Roughly a quarter of those that made it into My London Diary were taken with the 16mm fisheye, an unusually high percentage for me. 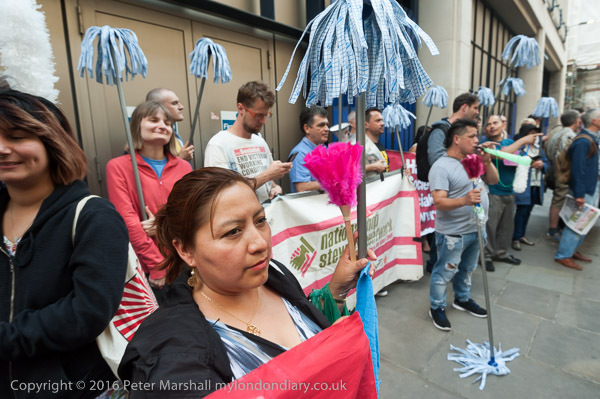 It is a lens that comes into its own when working in crowded situations, and the protest outside the back entrance to the CBRE offices involved a large group of people in a very confined space. But more than any other lens I think it is one that I have to be in a particular state of mind to use – and sometimes it will stay unused in my camera bag for weeks or more. And at times I’ll find myself wondering after covering an event why I didn’t think to use it. It isn’t easy to work with but sometimes it is the only tool for the job. I do use it with a little reluctance. It adds time to my processing as almost every image made with it needs to be taken into Photoshop so that I can straighten the verticals using the Fisheye-Hemi plugin. As well as taking time, this also uses up a ridiculous amount of hard disk space, as the image needs to be converted into a Tiff file to allow this to happen. Working with the D750, a typical RAW file is around 22Mb. The Tiff file from this will be around 141Mb giving a total for a single image of 163Mb. I’ll store images on two different hard disks – so that doubles the storage needed to over 320Mb. Add two copies of a full-size high quality jpeg and the full amount is around 350Mb. Even with hard disks now available with 6 or 8Tb of storage these files soon fill them up. If I work on the D810 with its larger 32Mp files the total gets to over 500Mb per image. I like to do this with landscapes as the camera can provide level indicators in the viewfinder while taking pictures, essential in avoiding converging or diverging verticals in the processed image, but I think these can actually help in pictures of protest such as a couple of those here. I’ve been using Fuji-X cameras for some years when I want something a little lighter and more compact than the Nikon DSLRs. They are usually the cameras I turn to when I’m not photographing events and don’t need the file size of the D810. The cameras I take on holiday. But though I like some things about them, and have got some decent results, I also have some reservations. They are just too complicated and the controls and menu system lacks the simple and logical pattern of the Nikons. And there are too many ways in which they are just not so responsive and so reliable. I can leave a Nikon switched on all day, safe knowing that the battery won’t run down and the camera will respond at the slightest touch of the shutter release. With all the Fujis, even if you switch off the rear screen and digital viewfinder, and don’t make any exposures, the battery still runs down. It’s kind of the worst of both worlds in that it Fuji cameras have an auto switch off that you can set, which does switch the battery off after the set time, but fails to stop the battery running down. When you want to take the next picture, even if the battery is still in juice, you have to wait a second or two while the camera starts up – and while you miss the pictures. With the first Fuji I bought, the fixed lens X100, things sometimes got even worse and the camera refused to switch on, either until you took the battery out and back again or pressed the shutter for ages, turned around three times widdershins and said the magic word. At least later models more or less fixed that, but still too often meant that when you pressed the release nothing at all happened. Then there is the colour. Most digital cameras I think have problems with intense reds, losing the highlights, but Fuji has its problems with greens as well – unless you like your grass super-emerald rather than au naturel. And my XT1 has another problem – which needs extra work on the raw files – in that some Fuji lenses give results that are far too magenta, typically needed a correction of perhaps -35M in Lightroom. It doesn’t seem to be something that every XT1 suffers from, though I have found fellow sufferers, and possibly it could be solved by sending the camera back to Fuji for repair, but it only came to my notice after the guarantee period (when the camera went back to Fuji twice for other issues) was up when I bought another lens. Then there are the mickey-mouse modes. I’d like to ignore them, but the combined ISO and mode knobs on the XT-1 are tricky to use, and changing ISO all to often puts you into what Fuji laughably call the Advanced Filter mode. The two dials are supposed to move independently – and sometimes they do, but other times both turn together. The resulting images are not nice. Jpegs rather than RAW and with impossible to correct contrast or colour or both. You can’t convert from ‘Dynamic Color’ or any of the others back to sensible colour, though you can just about get a half decent black and white. It’s a shame because all of the Fuji cameras I’ve bought – X-Pro1, X-E1 as well as those already mentioned have been almost there. Delightful in many ways, which is perhaps why I’ve several time bought another, but…. I’m even hoping that Fuji have at last got it right in the X-T20, and mug that I am, I’ll probably buy it. And then there are those X-Trans sensors. It seemed a good idea to get away from the Bayer pattern, but I’ve never been convinced that they really improve things, though Lightroom at least seems now to have learnt how to get usable results after a really shaky start. But if you still feel they are definitely an improvement (and Fuji cameras seem to have a unique facility to produce fanboys) you should read an article by Jonathan Moore Liles, which I first saw in PetaPixel, but is a little better read on medium com, where the pictures are larger. Its an article which I think more or less destroys the claims of superiority of the X-trans sensor, which can perhaps at worst be seen as a marketing gimmick and at best simply a different balance between colour and luminance, and one which has some unfortunate side effects. In practical terms these are seldom if ever particularly important, and are often mitigated or eliminated by suitable corrective processing which I tend to apply fairly routinely in Lightroom. There is a tendency in portraits – whether on Nikon or Fuji – for faces to look a little flat that a little brushing with a positive value of ‘Clarity’ can improve, and the whites of the eyes (sclera to use the technical term preferred by Liles) usually benefit from a little more brightness and contrast which I think reduces the colour bleed into them. The RAW file was processed using Darktable’s Markesteijn demosaicking algorithm (3-pass mode) with a single iteration 9×9 chroma median filter followed by application of a bilateral filter on the chroma channel and light sharpening. The color profile is my own, generated from shots of a Wolf Faust IT8 chart and should accurately represent the colors in front of the camera. Although I have nothing against open-source software – and there are several programs I use or have used (including before Lightroom got better another RAW converter) – I think the use of it here is a serious weakness in the argument. First it entirely locates the article in the high geek rather than photographic sphere, and secondly it raises doubts about whether this particular software is as effective as that recommended by the manufacturer (and privy to their unreleased data), or to the commercial software such as Lightroom (and Adobe have enjoyed some cooperation from Fuji) and Phase One. Of course, the debates about X-Trans and Bayer are marginal. Both can produce decent images and the differences between the two will seldom be apparent or important. Photography really isn’t about the minutiae of technical differences, but about what your images speak. 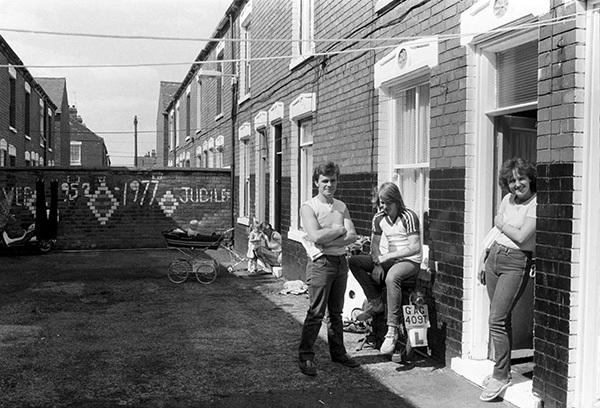 Back in 1983, the Radio Times and BBC2 held a ‘Photo-Assignment‘ competition for the BBC2 National Photographic Week Competition, and although I didn’t like the idea of having to send off my film along with the two 10×8″ prints I decided to enter a set of pictures taken in Hull. I loaded a roll of FP4, 36 exposures loaded from bulk into a camera body and set out on a Sunday morning in early August for a trip around the city taking pictures for the competition on that body as well as some just for myself on a second camera. Back home later in the week I developed the film, selected my two pictures and sent them off to New Broadcasting House in Manchester on 22.8.83. I was reminded of this today when I read the label on the back of an old print with my entry form stuck to it. It wasn’t the picture they chose, but the other I sent in was selected and they made two 12x9s and a 16×12 of it for showing on BBC2 and the touring exhibition. Not owning A TV (I still don’t, seeing enough in life and not having the time to watch it secondhand), I got my college to record the programme so I could see my picture on it for a few seconds. But it was the picture rather than the reverse of the print that caught my attention, and I realised it was an image I hadn’t seen since 1983 and had forgotten about completely. And it wasn’t a bad picture and would certainly have been included in my Hull book had I had it to hand. 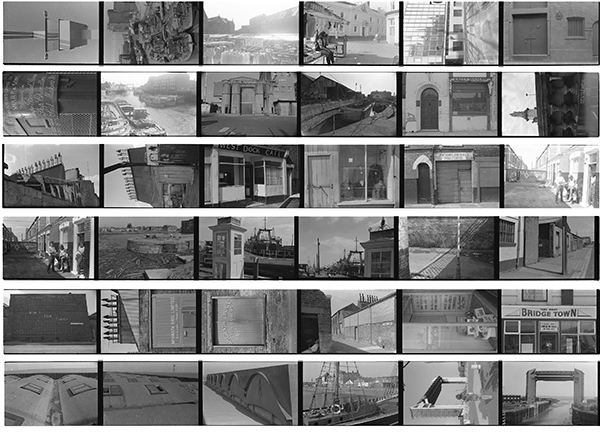 So I looked for it in my file containing the contact sheets from Hull, searching for it at some length, but it was nowhere to be found. The BBC had of course returned my negatives in the stamped addressed envelope I had included, and they came back in October or November and were filed with the work I was taking then – but somehow I forgot to make a contact sheet, which made the negatives were very difficult to find. Finally I did find them, and made the digital contact sheet above, rather too small to be seen properly in the small version on this post, but good to see at full size on my screen. Looking at the set of 36 pictures, it’s obvious that I had decided to go an visit some of the favourite locations I’d photographed earlier and retake versions of images I’d taken before. This isn’t generally a very good idea, as if you have made a good picture before you are likely to get something that doesn’t match up to it when you return. Though mostly I seem to have tried hard to make pictures that were just a little different, and in some parked cars or other obstructions made a repeat performance impossible. 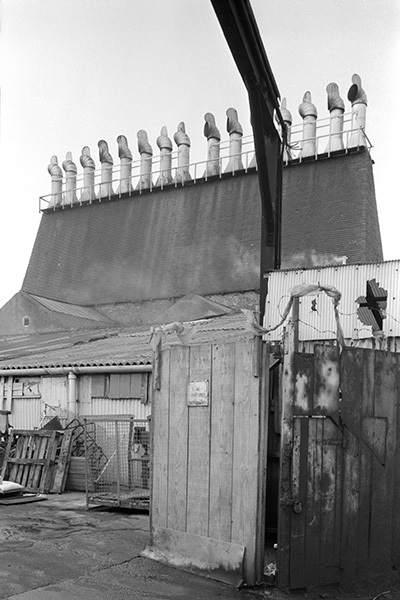 If you have are following my daily posts on Hull Photos for the UK City of Culture 2017, then today’s image showed the shadows of the chimneys of a Fish Smoke House, perhaps even the one in the image above, though there were several others in the area, all now gone – a piece of heritage lost. But the image I’d found this morning I’d only taken on the film for the BBC and it’s only one in the 36 where I made two exposures, presumably because I realised I had over-exposed the first. The two are almost identical so far as the three people in the foreground are concerned ,though the over-exposed frame is just a little better framed and has the woman and child in the background in a different position. It would have been hard to get a decent print from the negative in the darkroom, but I may be able to rescue it digitally. The pictures were taken using an Olympus OM-1 camera, and the FP4 was processed in Acutol. There are two slightly darker bands across every frame, only noticeable in even areas such as sky. I’m unsure whether these represent a film fault or uneven processing, but at least with digital these can be treated, and they are almost entirely invisible after a little work in Photoshop. Faulty film was not that unusual, particularly in bulk film, and I had some batches replaced by Ilford over the years, though they ever admitted the faults. Now I might be able to reclaim some of those faulty negs by digital retouching if I have time and patience. I had found the print when I went up into the dark recesses of the loft in my house, looking for more of the actual prints I showed in Hull back in 1983. I didn’t have a great deal of luck with these, only coming across a handful to add to those I’d already found. Perhaps I had sold a few, and others might have got lost or still be hiding in a cupboard or lost after taking them to talks or shows. 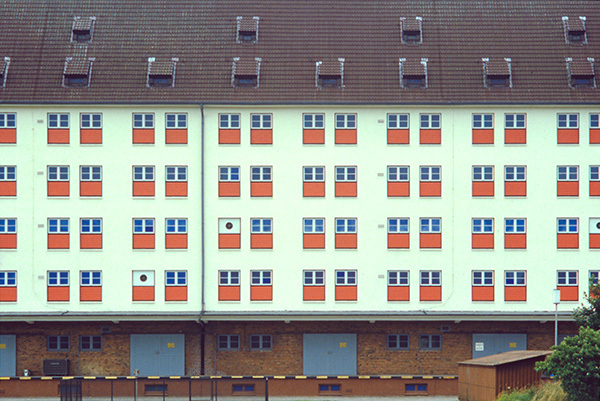 But as well as the print which led to my rediscovery of that BBC competition film, I also found a slide filing sheet with 14 sides from Germany in the early 1980s, including an image I’d spent several days searching the house for when I was producing the book ‘German Indications‘ and had to leave out, and a couple of others that might have been included had these slides, obviously selected to send to a gallery at some point along with some black and white prints been available. A couple of others are probably the originals of images which I reproduced from duplicate slides, although most of the duplicates, made using an Illumitrans slide duplicator, were of exceptionally high quality. The only way I can identify the originals is if they are in the original Agfa slide mounts, but some of them I will have taken out of these for various reasons, especially if I wanted to reproduce the full image, a small part of which is hidden by the slide mount. Which reminded me of a post on The Online Photographer a couple of days ago, on Color Correction (which I’d spell as Colour Correction) which is worth reading, including some of the comments. And you are welcome to download the above image as one to practice on though of course despite the lack of a watermark it is still copyright. 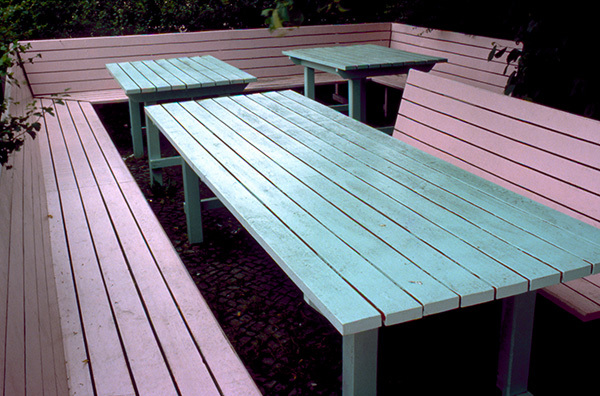 Slide films always added their own personality to the colour pictures we took, and we have now rather got used to the more accurate rendition of digital, though digital cameras too have their own differences. I generally prefer the results from my Nikons to those from the Fuji cameras I less often use, but others rave in admiration of the Fuji colours, especially in jpegs. I just adjust their RAW files to give something that seems more like I see. 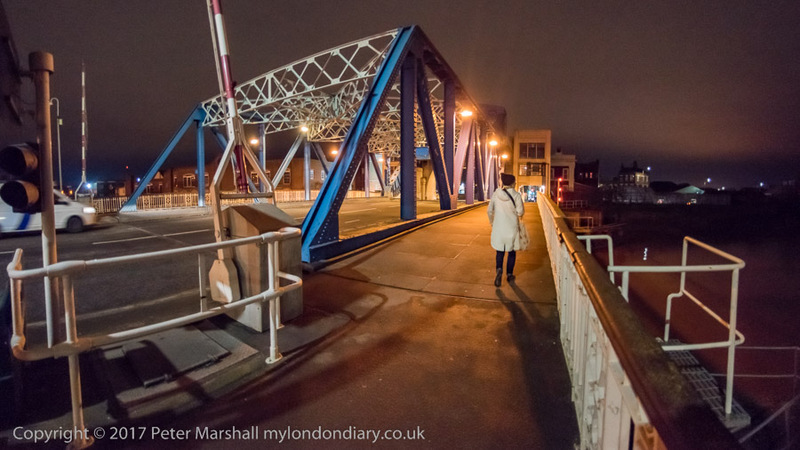 November is now complete on My London Diary. It’s a month I remember for being dark, cold and wet, certainly not my favourite time of year. I hate it when we change the clocks at the end of October, plunging into darkness around 4pm – by the end of the month sunset was at 3.55pm. London did get more rain than in the average November and most of it seemed to fall on me and my cameras. embedded into its EXIF information (you can, with difficulty find this Photoshop.) According to Nikon the carbon fiber composite shutter in the D700 should at least last 150,000 exposures. It isn’t actually the shutter but the mirror that is the problem – it sticks in the up position, blanking out the viewfinder. It happened first around half an hour or so earlier but I managed to free it by using the menu to ‘Lock mirror up for cleaning’, then switching the camera off and back on again, but after a few exposures stuck again and I had to repeat the process. I missed a few opportunites to make pictures doing this, particularly annoying when the police came to interfere with the protest. Back home, and testing the shutter it has been working perfectly, but a camera you can’t rely on isn’t worth carrying. And I am fairly sure the cost of repairs (and there are a number of other minor faults) would be prohibitive. So since then I’ve been working with the D810 and a D750, which I’d tried out a few days earlier. The D750 is a noticeably lighter, which is good, gives larger files – sometimes a bonus, but normally unnecessary – and has a tilting read screen, which is great for some things, though the ‘Live View’ you need to use is still clunky. And it somehow feels a bit cheap and has a nasty shutter sound compared to the D700. You are currently browsing the archives for the Technical category.